RICH HARPER has been singing the blues for almost his entire life. The Los Angeles-based singer, songwriter and guitarist grew up in a small town outside Pittsburgh, Pennsylvania and learned to play guitar under the guidance of his cousin when he was eight years old. Originally ``obsessed'' by ELVIS PRESLEY and THE BEATLES, he began playing country music until he discovered his love for the blues. ``My friend brought a CREAM record over and told me to listen to the guitar player and I had never heard anything like that before,'' Harper said. After learning that ERIC CLAPTON was a huge fan of BB KING, Harper went to his local record store and ordered in as much of the blues legends' material as he could. ``When I went and ordered in these BB King records, they'd ask which one I wanted and I'd say, `I don't know, just give me one'.'' By the time he was 11 years old, Harper was playing in local bars under the watchful eye of his father. ``As long as I had a parent or guardian with me, I could work in a bar,'' he said. ``I had the greatest dad in the world. He went to every gig and took me everywhere until I was 16 and got my own drivers licence.'' 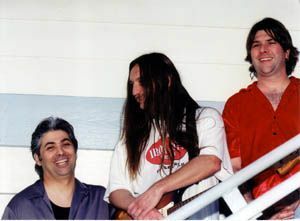 After relocating to Los Angeles ``where the weather was warmer,'' Harper met up with bassist FRAN SCARPELLIA and drummer CHRIS COOKE to form the RICH HARPER BLUES BAND. The band has established a strong following outside the US with its blend of blues- based rock, travelling as far as Scandinavia and Korea. It released the live album Onward in December 2003 and will embark on its first Australian tour this week. Before playing at the EAST COAST BLUES AND ROOTS FESTIVAL at Byron Bay, Rich Harper's Blues Band will perform at the NORTHERN STAR HOTEL on Saturday night.